A prison officer who smuggled in £10,000 of drugs has been jailed for six-and-a-half years. 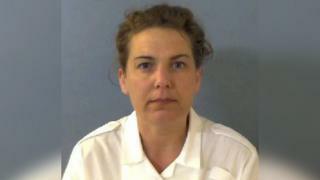 Claire Bennett, 44, also leaked prison intelligence to inmates at HM Young Offenders’ Institute in Aylesbury. At Aylesbury Crown Court, Bennett, of Hailsham, East Sussex, pleaded guilty to misconduct in a public office and offences relating to supplying drugs to prisoners. Thames Valley Police said her conduct “compromised safety” at the prison. Bennett, of Sandbanks Close, admitted one count of misconduct in a public office, one count of supplying a controlled drug of class B, one count of possessing a controlled drug of class B and one count of conveying a list ‘A’ prohibited article into/out of a prison. PC Maureen Moore, from the Thames Valley Police prison investigation team, said the officer’s actions “jeopardised the safe running of the wings”. She added: “Bennett knowingly brought drugs into the prison which causes danger and violence to both prisoners and officers alike. Prisons minister Rory Stewart MP said he was “pleased” to see Bennett receive a “significant sentence”.